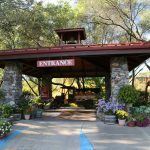 My first impression of Raymond Winery when I arrive for my “Winemaker for a Day” blending experience with my fiance, Tom, is that we are at a traditional Napa winery. The “Winemaker for Day” experience involves creating my own wine blend and bottling the wine to take home with my own label – which I am currently designing with a happy employee named Casey at the tasting room counter. The tasting room has beige walls and white counter-tops with a wall of windows and a display of winery souvenirs to purchase. The entire room has a warm, country charm to it. As I confirm the picture, font, and color I want to use for my label, I note that perhaps the only thing that sets this place apart from other tasting rooms is the overt friendliness of the wine pourers. Then I see the other tasting room. Sarah, our winemaker tutor for the blending experience, leads us out of the “normal” tasting room and through the lobby into an adjacent room. The vibe immediately changes the second I walk into the room. Mood lighting reminiscent of a Virgin America jet jumps out at me from retro, stainless-steel walls. The mirrored bar has a downtown nightclub feel and looks as if the bartenders should be pouring cocktails and not just wine. I look up and see a scantily clad mannequin dangling from a suspended bar. Two more go-go dancer mannequins flank the sides of the bar. This was not going to be a normal winery experience. Sure enough, as soon as we enter the blending room, a fluorescent lit, lab-inspired room with silver stools and tables, Sarah walks over to a chair and lifts a couple of gray, metallic lab jackets off of it and hands one to Tom and me. She gestures to some metallic hats for us to pick from as well. “Time to get mad scientist,” she says playfully. I shrug into my coat and put a silver beret on my head. Tom opts for a mad hatter type top hat. We look at each other and burst out laughing and then sidle over to the table set up for us. The tasting experience can accommodate up to 14 participants, but due to some last minute cancellations from some other parties (hmmm…perhaps too much wine tasting the night before?) Tom and I have the blending room to ourselves. My workshop table is set up with a graduated cylinder, a beaker, and a pipette. In the center of the table is a worksheet with some checkboxes and columns titled A, B, and C. To my left is the most important part: four canisters of wine. I survey the contents in front of me and wonder how long until we can start drinking the wine. “So, how do we do this?” I ask, excited to get started. Sarah explains that the four canisters of wine are for us to taste and figure out which notes of each we want to bring out the most in our wine. So the first step is wine tasting. This is my kind of excursion. The four wines we have to try are Cabernet Franc, Merlot, and two different versions of Cabernet Sauvignon – a neutral oak vintage and a new oak vintage. Our goal is to find the perfect percentage of each of these wines to blend a well-balanced, palatable wine. “Do you know the difference between neutral oak and new oak?” Sarah asked. 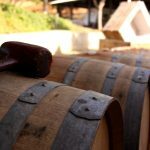 “Neutral oak is aged in wooden barrels that have already had wine aged in them and are usually at least five years old and new oak means the wine is the first to be aged in the barrel,” Tom replies. “That’s correct,” Sarah says and Tom beams proudly. I flash him a knowing grin since we literally had just learned that fact the day before at another winery in Napa we had visited. I taste each of the wines and prefer the Cabernet Sauvignon new oak; it’s milder than the other blends, but still has a tart aftertaste so I think it will be a good base for my blend. I pick up my pencil and under column A write 50% for Cabernet Sauvignon new oak, 30% for the neutral oak, 10% for Cabernet France, and 10% for Merlot. I figure 50% being Cabernet Sauvignon new oak is a good starting point. Tom, on the other hand, puts his mathematical skills to use: 54% Cabernet France, 27% Merlot, and the two Cabernet Sauvignon’s making up the remaining 19%. Sarah tastes mine and gives me some recommendations. “I think the Cabernet Sauvignon is taking over too much. Try some higher percentages of the other two.” She moves onto Tom. After taking a sip, she looks at him in surprise. “This is really good!” she says. “Casey, come taste this wine,” she calls to the back room of the blending lab where Casey is making our labels. After thanking them for their praise, Tom catches my eye. “Ha!” he gloats and grins at me. I glare at him. “Beginner’s luck. 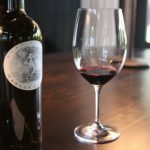 By the time I’m done, my Icopinot will put your Tarnachianti to shame!” Despite the fact that we are technically making Bordeaux blends, Tom and I decided to name our wines after some other varietals with a play on our family’s last names. We thought we were quite clever. In addition to making us wine-naming geniuses, drinking copious amounts of wine apparently also make Tom and I much more competitive because we silence up for a bit and diligently measure out a second and third round of blends. Well, I should say we silence up from talking to each other. Sarah also has a wedding coming up and so she and I discuss planning weddings and I tell her my idea of buying some of the bottles we are making to put on the tables at our wedding reception. This might be starting to get out of hand. After completing our three blends, we taste all of them again to decide which we like best. Sarah once again comes to each of our blending stations to taste our creation with her spit cup in hand. Unlike us, she can’t get tipsy off this experience of ours. Tom and Sarah agree his first blend is still amazing and after some back and forth, I decide I like my third blend the best, which has much more Cabernet Franc in it compared to my first blend. Much to my annoyance, I still prefer Tom’s first blend to mine. “I’m just a wine-making natural,” Tom says proudly. “Uh-huh,” I say with a scowl. We collect our worksheets with our blend percentages and follow Sarah into the bottling room where Casey is waiting for us. The bottling room has a wide stainless steel table with a massive graduated cylinder in the middle of it. “You guys ready for the bottling portion?” Casey asks as we enter, still in our silver jackets and hats. “I’ve got your labels all finished up.” She shows me mine on the computer. 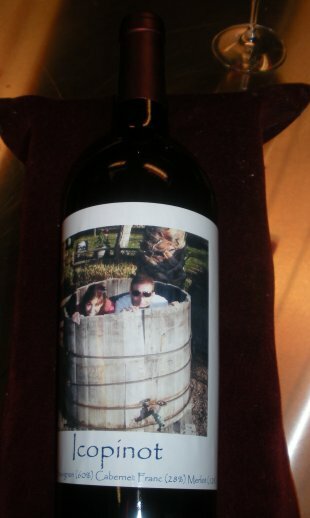 A picture of Tom and I peeking out of a big wine barrel at a vineyard in Temecula, California with the words “Icopinot” underneath is displayed on the screen. I begin the process of measuring out the wine in a graduated cylinder again, only this time with enough to make a liter bottle. After completing the measuring process, Casey holds a funnel over a wine bottle and I pour the wine through it from the beaker and into the bottle. “Now the fun part,” Casey says and places the bottle into a mechanical looking contraption. She places a cork on top of the bottle and explains I need to push down on the lever of the machine to cork up the bottle. I do so, and voila! My bottle is corked. But not completed. Next, Casey leads me to another machine. This one is for encasing the top of the bottle in foil. Once that is done – which only takes a few seconds – she hands me a printed off sticker of my label and I carefully place it over the top. I add another sticker to the back with the Raymond Winery name on it and my wine masterpiece is complete. Tom and I each get a bottle of our wine to take home and order two cases for our wedding. Indeed. If not, our guests are going to be drinking some pretty funky tasting wine at the wedding. But I decide it’s worth the gamble to have the extremely fun memory of the blending experience highlighted at our wedding.